bzimmer.ziclix.com / Mochi, mallets, yum. 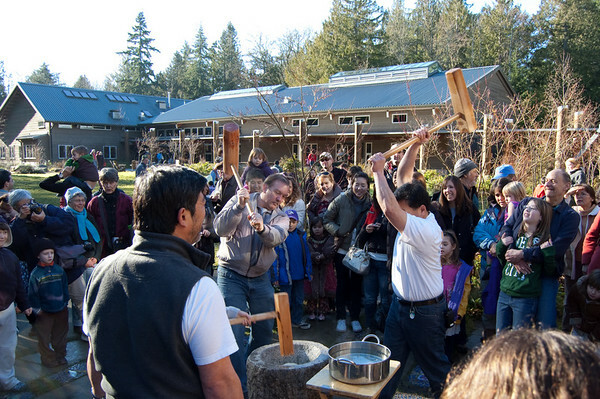 When the storms hit after Christmas the Mochi Tsuki Festival at Islandwood, courtesy the Bainbridge Island Japanese American Community, was one of the casualties — fortunately it was just postponed. We've never been to the long-time Island affair and we were excited, the gorgeous blue skies, perfect temperatures and outdoor venue at Islandwood certainly helped! I, for one, was unclear on the mochi making process. 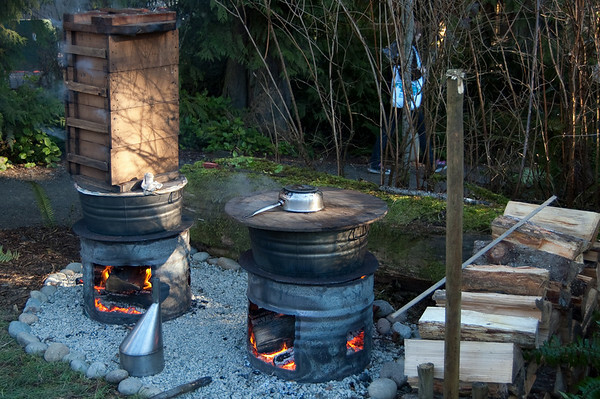 Like so many great foods it starts over an open fire — the firebox on the bottom, hot water in the tubs and the rice steaming in boxes over the boiling water. From the fire the rice is dropped into a large granite bowl — rumor has it no one knows the age of Bainbridge's. The consistency of the rice at this point in the process doesn't look much different from a nearly done risotto. To finish it off, out come the mallets and the pounding begins. 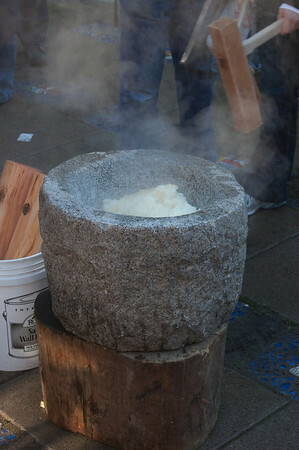 There are a couple different methods, done in progression, for removing the moisture from the rice. 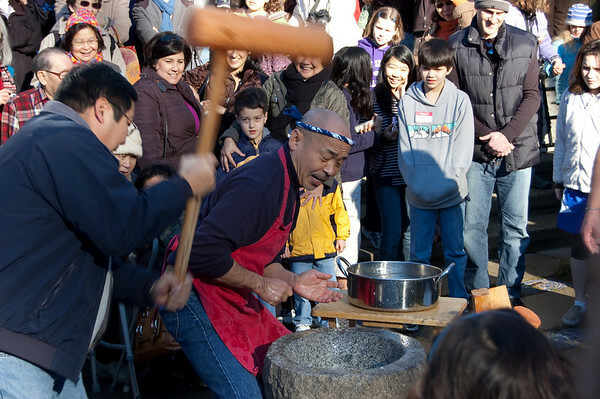 First, some simple kneading with a couple of mallets, carefully orchestrated — unless of course a volunteer from the crowd is helping and keeps hitting the other guy in the head with the mallet handle. Then, in our case, three work in unison, swinging away. Finally it's down to one mallet and one set of hands. 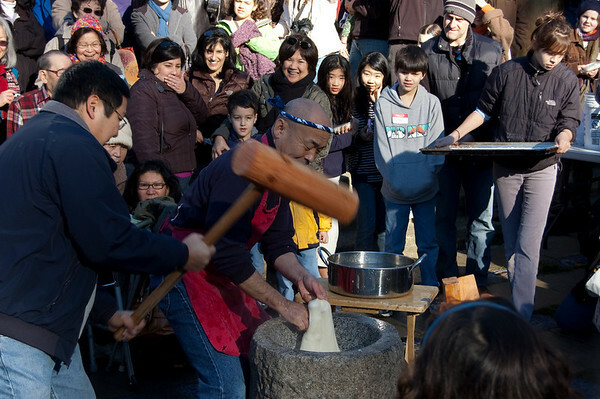 The mallet strikes down, then up, the hands go in, folding the mochi as you'd knead dough, hands out, mallet hammers home again, mallet up, hands in, mallet, hands — all the while chants ring out. 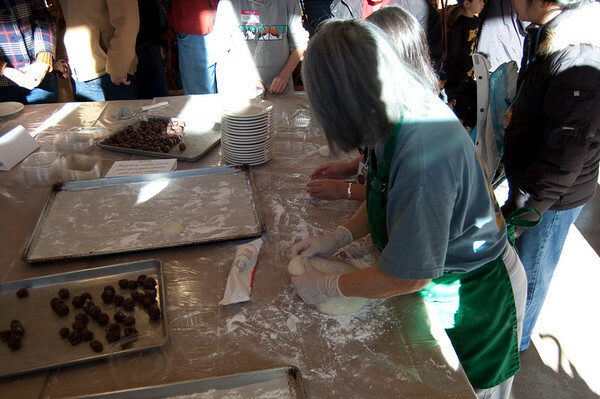 The finished product is pinched off into balls, variously stuffed — I've read ice cream is a popular center. My daughter rolled out her own, stuffed in the center with red beans and sugar — yum! It's definitely my kind of sweet. I've been hearing quite a bit of buzz about animoto but I hadn't tried it myself. For those who don't know, animoto sets a series of photos to music creating a very dynamic slideshow. I'm unleashing only my second full-length video on you, please be kind but feedback is welcomed! I bought the year-long All-Access Pass so be prepared! If you want to save $5 dollars on your own All-Access Pass & 3 months All-Access for me, please use my referral code: vzogtbqy.